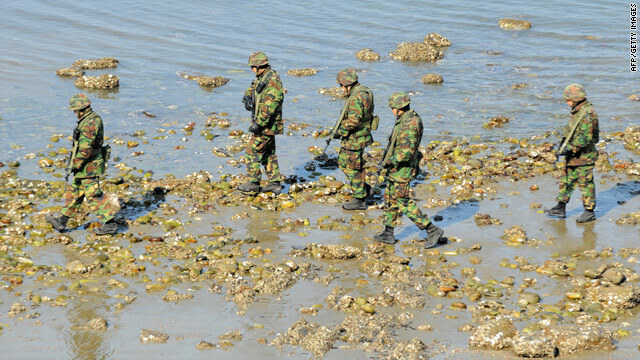 The South Korean warship that was sent to recover the oil tanker hijacked by Somali pirates on Sunday has finally arrived near the location of the tanker. The South Korean destroyer ship was only 930 miles aways when the tanker was hijacked. 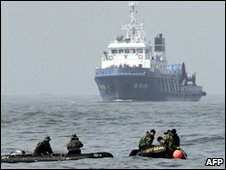 The South Korean navy is going to keep its distance for now, as the pirates have yet to make demands. 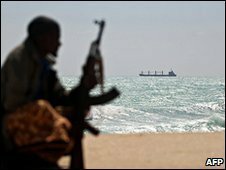 The Samho Dream is one of man ships hijacked by Somali pirates in recent years, as the pirates have been successful in receiving ransoms for their attacks. South Korean Defense Minister Kim Tae-young has stated that a torpedo is more likely to have been the cause of the ship’s collapsed rather than a sea mine. However, he had not made mention as to who may have shot the torpedo. A definitive cause cannot be discovered until the ship is salvaged. This announcement was made less than a day after President Lee Myung-Bak warned that an investigation must be made ‘without suspicion or negligence. Forty-six sailors are still missing and rescue workers have resumed the search after halting efforts for two days due to severe weather. Pyongyang has refused to comment on the matter. After rescuing 58 sailors of the 104 on board the South Korean Naval ship that sank last week, authorities have not found any signs of life near the site of the explosion. However, it may be possible that the missing sailors found a cave of some sort for refuge so authorities continuing to search. Last week, an explosion brought down the ship near the island of Baengyeong. Since the island is so close to the North Korean shore, an attack was speculated, however South Korean authorities have since dismissed that theory. The radar had not shown an signs of torpedo before the blast. Officials are now speculating that an old North Korean sea mine from the 50s might have been the culprit. While they were removed in 1953, it is not likely that 100% of them were removed due to the difficulty in retrieving the thousands that were placed. Previously mines have been found in 1959 and then another in 1984.